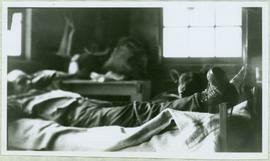 Photograph depicts unidentified man and dog laying on bed in bunkhouse. Miscellaneous items can be seen on table in background beside window. Handwritten caption beside this photo reads: "Bunkhouse". 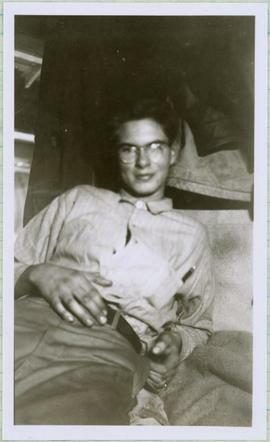 Handwritten caption above this photo reads: "Sophie [Haach?] [lived?] in the Adams House". 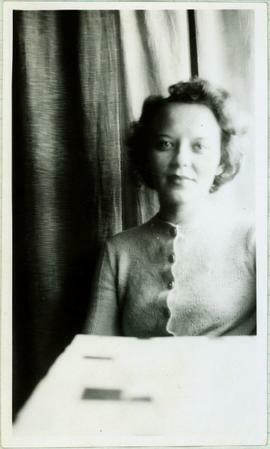 Photograph depicts Sophie seated behind table, curtains in background.